Win bonus & free spins every day with our casino Advent Calendar. Sign in every day and claim even better rewards. Experience the magic of Christmas with 25 days of festive treats. It's that time of the year again - and we have a special Advent Calendar with prizes to claim every single day. There's free spins, bonus and lots of other goodies in the run-up to Christmas. What lies behind today's door? There's only one way to find out; head to our promotions page and take a peek. You could get deposit spins on a NetEnt game - or net yourself a sizeable match bonus. Today's offer: What does the wild west have to do with Christmas? It's not really important when there's a 300% deposit match up for grabs. Deposit £20 and your money will be tripled! Use it to play on slots like Jack and the Beanstalk. This promotion will be active between 00:01 21.12.2018 and 23:59 21.12.2018 . A bonus of 300% of your first deposit of that day up to a maximum of £60 will be added to your account. Bonus funds carry a wagering requirement of 40x the sum of your deposit and bonus amount (e.g. £10 deposit + £5 bonus x40 = £600), which must be met before the bonus and any winnings are converted to capped cash, and this and any further winnings become withdrawable. 20th December: It's time to change the seasons and bag yourself a cash prize! Play the Seasons slot by Yggdrasil and opt in to their latest leader. Then all you have to do is activate the main feature four times. Do this in the least amount of spins possible to bag a prize. 19th December: It's time for another steamy Christmas present. Today, you can claim 20 extra bonus spins on the Microgaming slot Fortunium. Deposit £10 or more to get your spins. 18th December: Forget the stocking - stuff your balance instead. Triple your deposit instantly with a 200% bonus and play Red Tiger slots. 17th December: Excess is common during Christmas - and today you can stuff your balance with 100% extra bonus. Make a deposit up to £100 and your cash will be instantly matched with bonus. 16th December: Christmas is all about giving - and today we're giving you 20 bonus spins on Fruit Shop Chistmas Edition for a £10 deposit. Make your deposit to get your spins in seconds. 15th December: Spend Christmas with the Jungle Book crew and earn cash prizes. Play this excellent Yggdrasil slot and switch realms four times - do this in the least amount of spins possible to potentially win. 14th December: Choose your free spins reward with our tiered spins offer. Simply choose how many spins you want and make the matching deposit. 13th December: Get a bonus fit for a king to celebrate the holiday season. Get a 300% match bonus and triple your money up to £60. You can use it on some of our latest Red Tiger slots. 12th December: Walking in a Winter Wonderland? Warm yourself up with 50 bonus spins! Deposit £20 to get spins on brand new Leprechaun's Carol slots for some Irish luck this Christmas. 10th December: Plunder valuable loot chests and get your share of some Viking loot. Collect three chests in the Vikings Go Berzerk slot game and you could win a savage cash prize. 9th December: £10 could buy you a cheap DVD at your local supermarket. Or you could get 20 free spins on Wild Scarabs slot for an Ancient Egyptian adventure! Simply deposit £10 and you will receive your bonus spins within the next three days. 8th December: Make your slot game play roar this Christmas with a 100% deposit match bonus on Red Tiger slots. Anything you deposit up to £100 will be instantly matched giving you £200 total funds to play with. 6th December: Santa has come early - and he's packing a sack full of free spins. Choose how many spins you want on Secrets of Christmas slots and make the matching deposit - that's all there is to it! You could land 20 free spins for £10 - or really splash out and grab 75 free spins for a £50 deposit. No matter which one you choose, you're sure to have some festive fun. 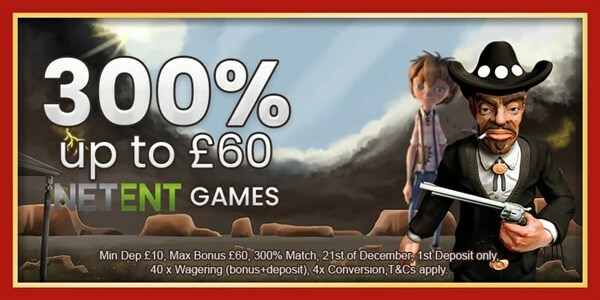 3rd December: Have the craic this Christmas with a 200% match bonus. Deposit anything up to £80 and you will get to triple your money. You can use the funds on our recent addition Rainbow Jackpots. There's pots of gold, pints of beer and mountains of fun to be had. 2nd December: £10 for 20 free spins? That's an Xmas bargain if we ever saw one. Simply make your deposit to get your instant spins on Leprechaun Carol. Ever wondered what Christmas would look like with a leprechaun in charge? Now's your chance. 1st December: We're kicking of our Christmas promotions in the strongest way possible. A huge 100% bonus to play NetEnt slots and games. Anything you deposit up to £100 will be instantly matched - giving you a potential total of £200 to play.